Plasmaglow Lightning Eyes LED headlight trim is the easiest way to give your car, truck, or SUV the unique look you've been wanting! This slim flexible light strip is specifically designed to bring you the popular new style of LED running lights found on late model luxury vehicles. These Lighting Eyes fade in and out in whatever color you choose showcasing an awesome breathing affect that will make all of your friends go "WOW!" 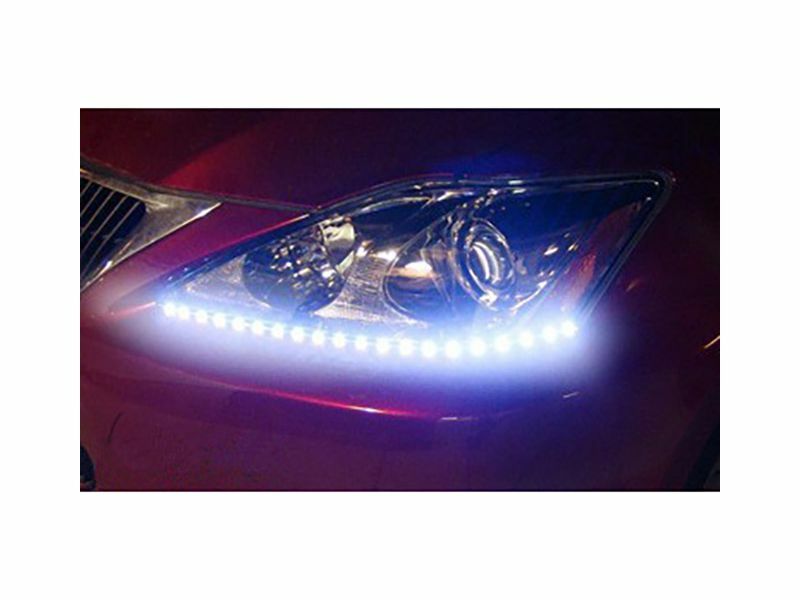 You can also select the standard Lighting Eyes in a range of colors that will add extra flare to your vehicle. Last, but not least there is the Duo Lighting Eyes, which show off two different color options at a time. The Plasmaglow LED headlight trim shines at an angle 90 degrees off the surface, so they can be mounted in the tightest locations allowing light to shine perpendicular to the mounting surface. Designed to be mounted under your headlights, this thin flexible LED strip is invisible while it is turned off, but features extremely bright LEDs when illuminated. Plasmaglow LED Headlight Trim kit includes two 19 inch strips or two 26 inch strips can be cut to length to fit any headlight housing perfectly. They offer easy application with super thin 3M adhesive that allows for stick on mounting. At less than 1/16″ thick, the Plasmaglow Lightning Eyes LED headlight trim kit can be used for a variety of other applications including door panels and gauge clusters. All Plasmaglow Lightning Eyes LED headlight trim items are backed with a one year warranty. The Plasmaglow Lightening Eyes LED headlight trim by Plasmaglow is an easy at home no drill installation. For additional information please call us at 877-216-5446.